Vizard (rhymes with “wizard”): 1) a rumored species of South Pacific island lizard featuring oversized eyes with an unusual far-seeing ability. 2) [Slang – archaic] an unusual cast of the eye, especially in those who purport to do magic or are deeply religious. In 1526, the infamous Dutch explorer, Willem de Vandergeertdervandervander, accidentally landed on a previously undiscovered South Pacific island (he was searching for Hoboken, New Jersey). While planting the Dutch flag, and after watering it, he felt a chill tickle up and down his spine like a friendly ship rat nuzzling for food. Someone – or some thing – was watching him. He looked right and then left and glimpsed nothing but palm trees, lapping blue waves and broken coconut shells. It was only when he looked right in front of him at the peak of an immense heap of seashell midden, that he observed a large sparkling green lizard with remarkably bulbous eyes. “Rotmensen, come quickly,” he shouted to his ship scientist, Rotmensen Naaktgeboren (translated loosely his name means “rotten people born naked” but don’t ever mention it to him). Of course Naaktgeboren was used to this. One of Willem’s quirks was that although born in the Netherlands to Nederlandish parents and having grown up in the Netherlands, immersed in Dutch culture and language, he spoke only in English. “It is undoubtedly a unique species of lacertilian sauria, and most astonishing indeed,” Naaktgeboren said. Willem stared in amazement at what appeared to be his elderly parents sitting at their kitchen table slurping Flemish stew. He immediately decided to obtain as many vizards as possible, both as additions to the ship’s mascot menagerie and because of the obvious potential for untold riches. Think how the Dutch royalty and aristocrats would clamor for such unusual creatures! However, catching the vizard proved next to impossible, as it was fleet of foot and no matter how fast a Dutch sailor armed with a net tried, the vizard was far faster, and with reptilian zeal, seemed to delight in the chase. Two years later, after several shipwrecks in which he lost all of his crew except hard-as-lice Naaktgeboren, Willem returned home laden down with an unpleasant-smelling spice no one wanted and vivid tales no one believed. The word vizard, however, gained brief currency as slang describing a person noted for a ‘guru-like stare.’ Deeply humiliated, Willem lived out the rest of his life in disguise as a gondolier, although he refused to live in Italy and never learned Italian, continuing to speak only in English. Naaktgeboren, who managed to sneak in several heavy gold bars on their return trip by hiding them in his stockings (although it made walking difficult), holed up in his mist-filled castle, conducting unmentionable scientific experiments (because he couldn’t see anything) and wrote puffed-up treatises on his past discoveries, including one on the mysterious lizard he’d once dubbed a vizard. Centuries later, brave explorers still attempted to find this legendary lost, probably extinct, species, searching from nameless island to unmapped atoll on and on and on around the world. There were numerous reports of single sightings, as well as rumored colonies of electric-green lizards which upon further investigation proved to be nothing more than the obscure but not unknown “dizzard,” a much more excitable yet easy to catch species of lizard. In 2012, rather blurry photographs purporting to show a vizard running went viral on the internet. However, analysis by photo-detectives proved that the tantalizing photographs actually depicted an old man from Conshohocken, Pennsylvania, vigorously brushing his teeth. The search continues…..
Saprobe: There are two kinds of saprobes, discovered independently in the 18th century; although some scholars posit that a Woodland Indians tradition hearkens back one or two minutes earlier. The odoriferous Vermont variety of saprobe comes from (or one might say, “gloms” from) the congealed sap of the sugar maple tree, while the Georgia variety, a much stickier yet more durable resinous robe, derives from the coagulated sap of the Georgia pine tree. Adopted by trappers, loggers and syrup makers, the saprobe provided warmth and protection during frosty winters and served as mosquito, gnat and fly attractants during the sultry months. Unfortunately, bears, cougars, hawks, crows, and skunks found the clothing unspeakably gorgeous, which eventually led to its discontinuance, however for a time North America featured some nattily dressed animals. Lemuel Bassington began his life as a fur trapper. Let me back up. He didn’t actually begin his life as a fur trapper. As an infant he was unable to trap fur-bearing animals, although he had good luck with grasshoppers. But by the age of ten he was a working man, complete with matted beard, coonskin hat and more than a pinch of snuff. This was back in the olden days, sometime around 1750. He roamed the colonies, trapping furs (the actual animals got away), subsisting on bitter berries, stringent barks and stump water, but by the time he was twenty years old, he needed a change. He’d discovered the benefits of pine gum and spruce gum and abandoned snuff for gum, which wasn’t too hard on his teeth since he no longer had any (he was begummed). He decided to set up a chewing gum business and began harvesting Georgia pines for their copious sap. One bright morning, after rolling the gum out in sheets, he allowed it to sun dry. Wrapping the finished product around his torso, he found it both flexible and malleable and then extremely difficult to disrobe. Experimenting, he fashioned a pair of trousers, only to find himself attached to the stump he was sitting on, unable to move. He sliced the trousers off with his long knife and tried again, this time creating a warm and completely unfuzzy robe. The old man passed by, but not before hurling a newfangled waffle at Lemuel, which stuck to his robe. He’d heard awhile back from an old fur trapping buddy, via passenger pigeon, that there was a lot of saps in Vermont. Since that was the entire message, he wasn’t sure if his pal meant the goo from trees or that there were a lot of sentimental fools living there. He decided to mosey on over to Vermont. Moseying meant that it took him a couple of years to arrive there, laden down with pine saprobes and assorted tree detritus. One day he came upon a grove of maple trees and people with wooden buckets attached. Let me back up again. These buckets hung from the trees, not the people. Each person, however, wore a sweet smelling saprobe. Lemuel thought and pondered and then pondered and thought. Could he combine the best features of the pine saprobe and the maple saprobe to create an even more effective saprobe? After days of experimentation, this proved to be true. But the new and improved super-duper saprobe, which was both a feast for the eyes and nose and even stomach, depending on your digestive system, attracted numerous fashion plates among the animal kingdom and Lemuel spent the rest of his life captive in a rabbit burrow deep in the woods of mountainous Vermont, only a saprobic legend to the wider world. Saprobe actually refers to a saprobic organism, one which dines on deceased or decaying organic matter, tending toward an environment as free from oxygen as possible. Scumble (archaic): 1) a stumble, intentional or otherwise, into scum-filled liquid. 2) a regional pastry briefly unpopular in fourteenth century England. Although scumbles never caught on as food, they proved extremely puzzling to archaeologists of the future, who discovered remarkably well preserved specimens holding up the crypts in Least Plover of the Peckling-Farrows’ ancient stone cathedral. Frederichastrausen “Fritz” Noodlegammer, noted authority on antiquarian organic material, precisely carbon dated the petrified scumbles, which after soaking in a fragrant combination brine/lye/acidophilus potion for several days (the scumbles, not Frederichastrausen “Fritz” Noodlegammer himself, who preferred bubble baths) delicately placed a sliver of scumble on his tongue, chewed for half an hour, ruminated for another half an hour and finally declared it “delicious, but needing a soupcons more silt.” Newspapers misprinted “silt” as “salt” and the ancient recipe discovered in the cathedral archives proved a failure in households around the world. However, the revived scumble provided a triumphant boost for the bowling ball industry. Scumble actually means: 1) softening the colors or outlines of a painting by rubbing or via an opaque film 2) in writing, to blur the outlines. Welcome to my new website. I plan to feature a variety of my writing projects here. 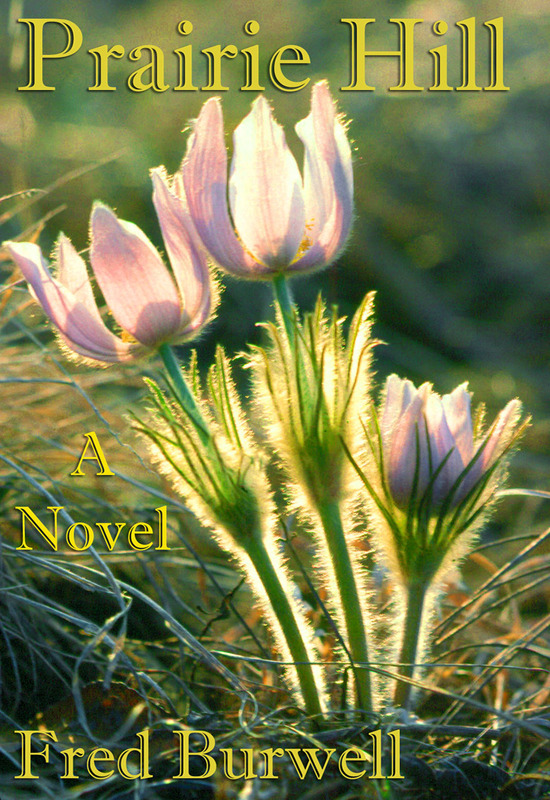 First, I am excited to announce that my novel, Prairie Hill, is available as an e-book at Amazon.com and its affiliates around the world. For those without an e-book reader, Kindle apps are downloadable for computers and many other electronic devices. I hope to have Prairie Hill available in print copies soon. I am also working on another novel as well as a collection of short pieces, Tales from a Misinformed Dictionary, some of which I will include on the website. I hope readers of all ages will enjoy them. I look forward to sharing my work and connecting with readers. Please feel free to contact me at faburwell@gmail.com. Chatoyance: When someone endures incessant chatter, despite wanting peace. Chatoyant: Someone primed to chat, someone who lives for chatting and when chatoyant, is unable to refrain from chatting, no matter how inconsequential the subject. Roland and Brisbane were brothers. As children, Roland was the silent, austere, studious one. He wrote well, with never a word out of place or in excess. From infancy, Brisbane was gregarious and loquacious. At first, other babies seemed to understand him, but after a few minutes of Brisbane’s incessant babble, they crawled away. By the time he was in school, he loved words and when writing, used as many as possible. Five page paper assignments never satisfied. He had to write ten. Ten page papers quickly became twenty. His diary filled his room and his parents had to rent storage space. For many years, Roland listened to Brisbane politely. They never fought, because Brisbane didn’t want to take the time away from talking. But Roland only listened. He never responded to Brisbane’s curious questions, other than non-committal mono-syllabic answers. He liked to spend time in his room, at peace with himself. Behind a locked door, he found refuge from Brisbane’s constant comment. Brisbane, however, kept close watch on the young chestnut tree growing beside the house. By the time the brothers were teenagers, the tree had grown strong and tall and Brisbane was at last able to climb it to the second level of the house where he built himself a tree house with a platform outside Roland’s window. From his perch he was able to resume talking during those hours Roland kept to himself. At first, Roland was mildly amused. He had made a great study of various species of monkeys, as well as Buddhist theology and decided that his brother Brisbane accurately fit the mold of the “chattering monkey.” However, he soon grew weary to the point of chatoyance. Even in his sleep he imagined his brother’s barrage of words. “Please stop” had no effect. “Go away and leave me alone” didn’t last. When Roland secretly tore down the tree house, Brisbane simply hammered it together again. Then two things happened. One month in summer, when Brisbane was off at public speaking camp, Roland took his father’s power saw and cut down the chestnut tree. He dug out the stump, smoothed out the ground and planted grass seed, which grew thick and luxuriant. Brisbane was devastated when he came back. He’d lived in that tree for the last year, even during blizzards and torrential downpours. He loved its strength, its beautiful flowers and nuts, and the opportunity it provided for him to have a personal speaking platform. It soon became apparent to Roland and the rest of the family that Brisbane was no longer chatoyant. He gave up speaking. Oh, he’d nod or shake his head in reply and occasionally utter a grunt, or when pressed, some sort of mumble, but he’d entirely forsaken his former eloquence. He ignored Roland, who sometimes saw what he perceived as a mysterious gleam in Brisbane’s eye. The brothers graduated from high school and Brisbane left town and did not return. Roland continued to live in the house, long after his parents died. As an old man he hired a detective to search for Brisbane, who was rumored to have immigrated to Australia, but the detective was unable to confirm anything. The only Brisbane he found proved to be a seven year old girl fond of ballet tutus. One fine fall day, Roland was raking leaves when he turned the corner of the house and below his window, found a scattering of chestnuts on the grass where the chestnut tree once stood so many years before. He felt the prick of fear and looked around him. There was no one in sight. Was this a practical joke? He threw the chestnuts down the hill behind the house, along with piles of leaves. No one answered. He threw the chestnut out the window. The next morning, while pouring his Special K cereal, out plopped a chestnut. This time, instead of throwing it out, he took it outside, scratched away a swath of grass underneath his window, and planted the chestnut, along with a great quantity of rare fertilizer, known as “guanaco” he’d obtained on one of his European trips. The tree grew quite well and within a couple of years was already reaching the level of his second floor window. He’d had no other chestnut experiences. A second detective had failed to turn up any traces of Brisbane, save for some graffiti in a marketplace in New Delhi, India, which read, “Brisbane talks,” although it might have been left over political sloganeering. Then one night around three a.m., Roland woke up. He heard something scratching against the side of the house. “Branches,” he thought. He closed his eyes. “I’ll trim them in the morning.” Then he heard the sound of tapping, which grew louder and louder until he recognized it as hammering. “I must be dreaming,” he said to himself. The hammering continued for another hour and then he woke up again as he heard his window being lifted up from the outside. And now there was a familiar voice, one he hadn’t heard in decades and oh how he’d truly missed it. The voice grew in volume. The words began to flow. The sentences built into paragraphs. The paragraphs became full blown oratory. He listened to the words of someone who over the many years had at last become not a prodigious bore, but a brilliant chatoyant. “Brisbane?” Roland said. He thought he heard a whispered “yes” amidst the endless river of words. Chatoyant actually means: having a changeable luster or color with an undulating narrow band of white light. Chatoyance is the quality or state of being chatoyant.